Mirrored Love – Just Sayin’! Sometimes all we need is a nudge to get going and when it comes to card making what better place to get that nudge than the Stampin’ Up! Annual Catalog! That’s what I did for the Just Sayin’ Stamp Set. So often I look at this stamp set and all I see are word bubbles on cartoons so I turned to page 109 for inspiration and a little CASE’n. My first card was a lot of fun to make as I used a LOT of different elements on it. From the Word Bubble Framelits, the Hearts Collection Framelits, and the Deco Labels Collection Framelits. 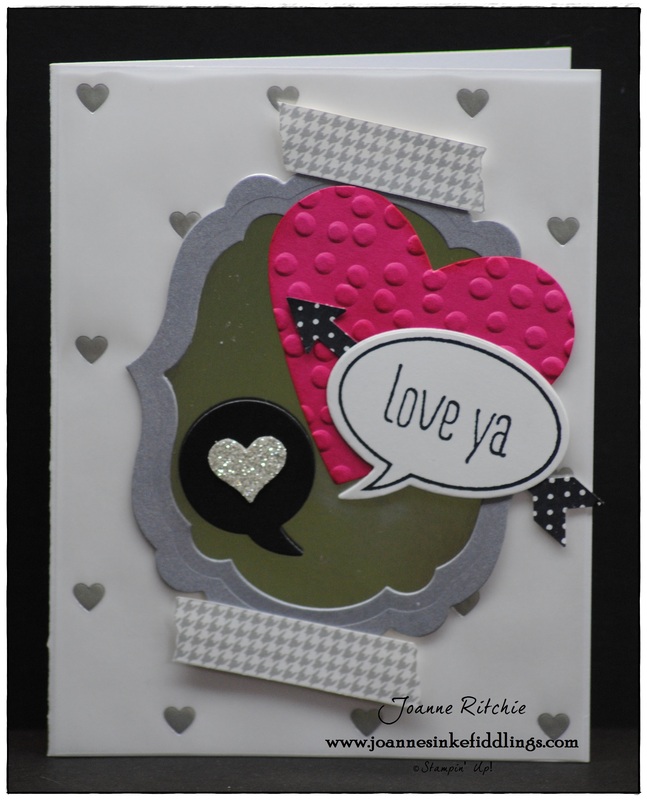 Then there was the What’s Up Punch and the Heart Punch from the Itty Bitty Accents (IBA) Punch Pack. As I used the Silver Foil Heart Vellum as the background, where in the catalog gold Washi Tape had been used, I used a stamp from the Tape It Stamp Set in Smoky Slate Classic Ink. A combination of Silver Foil Paper and Brushed Silver Cardstock created the “mirror”. It was so much easier having a basis for the card I couldn’t help myself but CASE another card from that same page. I really like my interpretation of this card! As I say, all one needs is a starting point then the world’s your oyster. Sometimes its much easier to create something when you know what you DON’T want rather than knowing when you don’t know what to do at all! If you would like any of the products used on today’s cards, please contact me and let’s get this party started!! !